1992 - Annual Hollywood Рождество Parade. Ashley Fuller Olsen and Mary-Kate Olsen attends the 61st Annual Hollywood Рождество Parade at KTLA Studios Green Room on November 29, 1992 in Hollywood, CA.. Wallpaper and background images in the Mary-Kate & Ashley Olsen club. 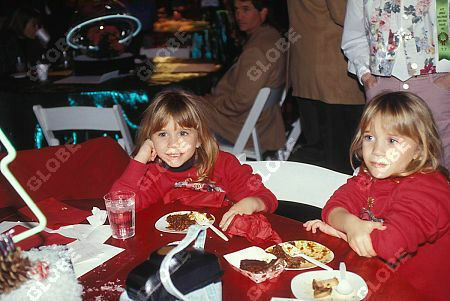 Ashley Fuller Olsen and Mary-Kate Olsen attends the 61st Annual Hollywood Рождество Parade at KTLA Studios Green Room on November 29, 1992 in Hollywood, CA. This Mary-Kate & Ashley Olsen photo contains ужин, antipasto, and антипасто. There might also be праздничный ужин, обед, завтрак, второй завтрак, официальный завтрак, tiffin, dejeuner, ланч, тиффин, октября, and обеденный стол.